That allow you to produce an even more ideal field. Cont [G Zone]: During your turn, if this card is face-up, all of your front row 〈Zodiac Time Beast〉 Units gain power+1000. Act (VC) 1/Turn: [Counter Blast 1 & Choose 1 face-down card from your G Zone, flip it face-up] If your Heart Card is a 〈Zodiac Time Beast〉, choose of your Grade 1 or higher Rearguards, return it to the Deck, then search your Deck for up to 2 〈Zodiac Time Beast〉 that are Grade -1 of that card, Call them to separate (RC), then shuffle that Deck. 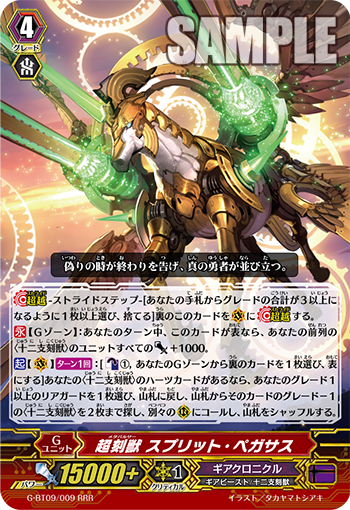 Cont (RC): If you have a 〈Zodiac Time Beast〉 Vanguard, this Unit gains “Intercept” and “Cont (RC): This card can Intercept from the back row.”. Cont (RC): If this card is [Rest], this Unit cannot be chosen by the effects of your opponent’s cards. First is “Metapulsar, Split Pegasus”, used by Shindou Chrono in the animated series!! For the first time in history, it’s a G Unit that has an ability that activates while it’s face-up in the G Zone. While it’s face-up in the G Zone, all of your front row 〈Zodiac Time Beast〉 Units gain Power+1000!! In other words, if there are 4 “Split Pegasus” face-up, you’ll gain a max total of 4000 Power!! And, by returning a Grade 1 or higher ally to the Deck, you can Call 2 〈Zodiac Time Beast〉 that are 1 Grade less than the returned card. By instantly Calling 〈Zodiac Time Beast〉, you’ll be able to profit based on the state of battle. “Pulsar, Stratos Falcon” has an ability that when it appears as a Rear-guard during the Battle Phase, it gains Power+4000 and can chance locations with an ally 〈Zodiac Time Beast〉 Rear-guard. So if it’s Called from the Bind Zone by “Metapulsar, Huang-long”, you can have it change locations with a 〈Zodiac Time Beast〉 in the front row that’s finished attacking, meaning you can increase the number of times you can attack! “Pulsar Tamer, Nepada” shows its ability when your Vanguard is a 〈Zodiac Time Beast〉! It’s a Grade 1 that can Intercept, and it can even Intercept from the back row! Also, when it’s at Rest, it cannot be chosen as a targetby your opponent’s card effects. Call it with “Split Pegasus”, and after Boosting, you’ll be able to protect your Vanguard. “Divine Dragon Caper” contains many cards that empower 〈Zodiac Time Beast〉. As different cards increase, you’ll easily be able to assemble different 〈Zodiac Time Beast〉 in your Bind Zone, making “Deus Ex Machina, Demiurge” even stronger!! Pay attention for further news about the 〈Zodiac Time Beast〉.